In Moovly Studio, you can make an object move to a new position using the Move & Transform animation (formerly known as "Move & Zoom"). And you can do this repeatedly with a sequence of different positions. Move & Transform also allows you to change the object's opacity from point to point. use any combination of zooming, moving, rotating or opacity changes. While there are so many possible combinations you can define yourself, there are also a number of presets you can start from and modify. To use the Move & Transform animation on an object, first select the object. Next, click the "Add animation" button (bottom of the Timeline) and choose the Move & Transform effect from the animation options list. Click the first key point (A) of the animation in the Timeline. The key point will turn blue and the Playhead will jump to that position. With the Playhead there, now change the desired starting position and size of your object on the Stage. This is now the new starting position. Next, click the end key point (B) of the animation in the Timeline. This key point will also turn blue and the Playhead will again jump to that position. With the Playhead there, now change the desired end position, size and rotation of your object on the Stage. This is now the new end position. A pop up appears informing you that a new key point has been added on the Timeline. 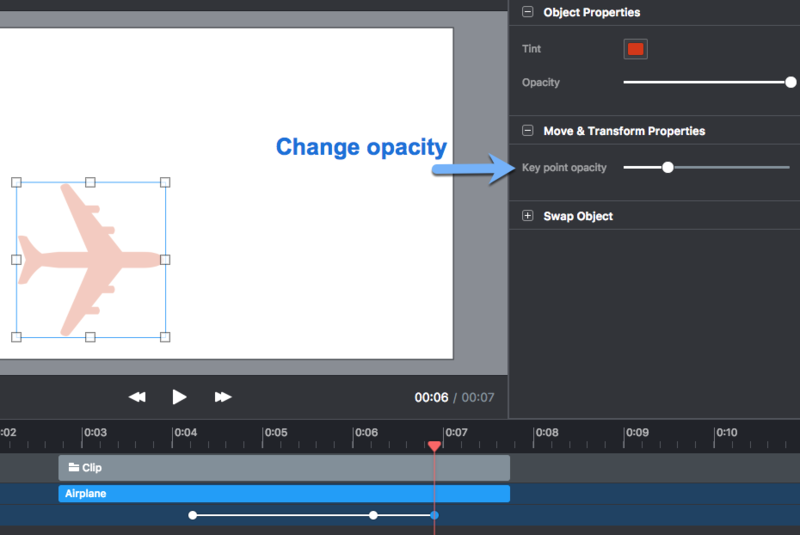 You can now move the object to a new desired position, size and rotation in time. It is also easy to remove a key point: just right-click it and select 'Delete'. Or select a key point and hit your Delete or Backspace key! Note: in the general Object Properties, there is also an overall opacity level you can apply to the object. This determines the maximum opacity of the object across the whole animation (including all key points).